Notice that the <h2> elements are gone in this case. Instead of using headings to define the separation between elements, you provide an unordered list (<ul>) instead. The list must contain a href to each of the <div> elements in the page. There isn’t any difference in the page content. You also need to provide some CSS to format the control as shown here. In this case, the #Configuration style defines the overall size of the tabbed interface and the fact that the tabs have centered text. The #Configuration div changes the content alignment to left. 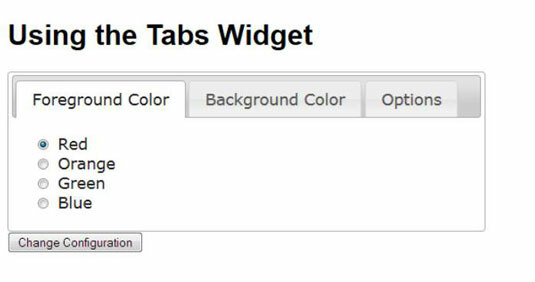 To make a change, you click the tab that contains the information you want to see. You make changes as normal. Clicking the Change Configuration button sends the changes to the server. If you test this example by using the same process you did for the accordion example, you get precisely the same results — only the interface appearance has changed.